Australia's Classification Board is re-reviewing the case of Aliens vs. Predator, the upcoming shooter from Rebellion that was refused classification earlier this month. If it's Monday, then it must be time to point and laugh at Australia, the country that just can't seem to figure out this whole "grown up gamer" business. Today, though, we're going to go a bit easier than usual on the good folks Down Under and deliver a bit of potential good news instead: The Classification Board is taking a second look at Aliens vs. 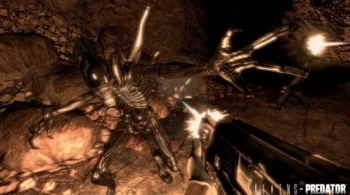 Predator, the xenomorriphic shooter coming out in February 2010 that was refused classification as a result of explicit (and explicitly awesome!) violence. As expected, Sega has appealed that decision and a "re-review" is now set to take place on December 18. The Classification Board was also seeking input from "interested parties" on the matter, but since the deadline to apply for standing is today, it's a bit of a moot point. The fact that it's getting a second look is good news but much like the report earlier today that Australia's federal government is holding a public consultation on R18+ ratings for games, it doesn't really mean much in itself. The review board was quite specific in its reasons for denying the game a rating ("explicit decapitation and dismemberment, as well as locational damage such as stabbing through the chest, throat, mouth or eyes," for instance) and since the content hasn't changed, it's unlikely the decision will either. Furthermore, it's a safe bet that anti-gaming activists like Michael Atkinson will be pulling whatever strings they can reach to ensure that the "refused classification" stands. Assuming the Classification Board sticks to its guns, it'll be interesting to see if Rebellion follows through on its vow not to modify the game for release in Australia. Whatever happens and faint though the hope may be, we'll keep our fingers crossed.